I love to eat! I am not particular or picky, and I don’t discriminate against food! So, when I first got engaged, I knew that something I was going to have to do was to put my love for food aside and work on finding healthier options for my palette. Don’t get me wrong, it has not been easy, but I do feel like this week I finally hit my stride. Not only have I (the Bride-to-Be) begun making healthier choices in my eating but I have started my work out routine as well! All good things! Today I have a recipe to share that uses healthier ingredients in comparison to the way it is normally made. Keep reading our first edition of this “Healthier Options” series to discover a recipe that is easy to make and light as well! 1. Heat 4 tablespoons olive oil in a large skillet. 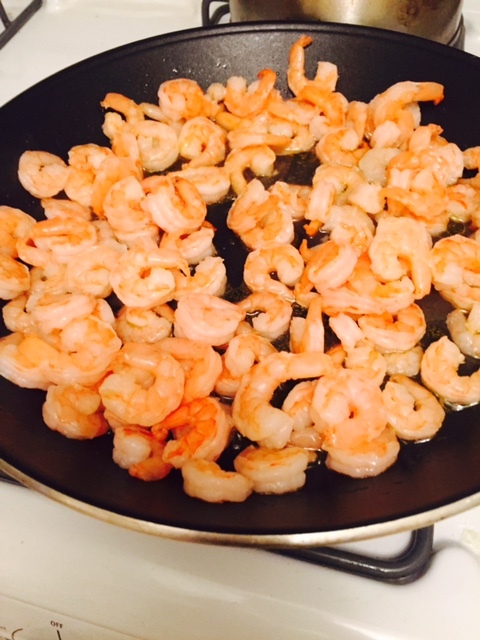 Add 1 1/4 pounds medium raw shrimp (peeled and deveined) and sautee until just pink (about 2 – 3 minutes). 2. Add 6 – 8 cloves minced garlic and cook, stirring constantly, for an additional 30 seconds. With a slotted spoon, transfer the shrimp to another dish and keep it warm. 3. In the same large skillet, combine 1/2 cup reduced sodium chicken broth, 1/2 cup white wine, 1/4 cup fresh lemon juice, 1/4 cup parsley, salt, and fresh ground pepper to taste. 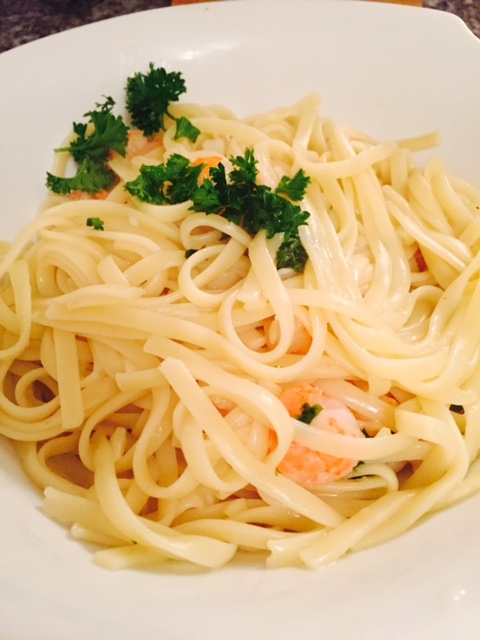 * Shrimp scampi is traditionally made with butter. The combination of chicken broth and wine makes for a much healthier option. 4. Bring the broth to a boil and let cook uncovered until it is reduced by half. 5. Pour the sauce over the shrimp (and pasta if you desire) and garnish with a little extra chopped fresh parsley. By now it is not a surprise that our very own Lauren is pregnant with identical twin girls, and as the day they are born quickly approaches, Lauren finds herself wondering more and more how to prepare for this huge change in her family dynamic / home. Of course, she and Scott feel extremely blessed and can’t wait to meet their girls, but that doesn’t stop them from also feeling freaked out and trying to seek out “experts” who can shed some light on this topic. Our friend Erin happens to be a mom of twins herself and has offered so generously to share some advice for preparing both your mind and home for two babies to come. So, without further ado, we introduce to you … our guest blogger, Erin! When Tami and Lauren asked me to contribute a post about twins, I spent a lot of time reflecting back to what feels like decades ago, when my twin girls, Addie and Ella, were born. It has only been 2 1/2 years, and it has absolutely flown by, but for some reason those early first few weeks seem like a lifetime ago! Maybe it was because I was in a consistent vegetative state of exhaustion for the first few months ….. Or, maybe it’s because we have come SO SO far since then. It couldn’t possibly have been a part of recent history. Never the less, I’m honored to share some advice about having twins. Whether you have twins, are pregnant with twins, or just know someone having twins, this is an effort to pass the good news along …. You WILL survive, and so will your babies ….. but these things should make life a bit easier for you! All women whether young or old, married or single, mother or not will think they know the “right” or “best” way to raise a child. There will be an overload of information placed upon you. Your mom will say this and your mother-in-law will say that. Your best friend will tell you this and your neighbor will tell you that. Take it all in, but in the end do what is best for you and your little family and throw the rest of the advice out the window. Your way IS the “right” and “best” way. You may find yourself on bed rest while carrying these little ones. Eat your favorite meals. Watch your favorite movies. Binge watch an entire series of a television show on Netflix. Sleep! While it seems inconvenient in the moment, there will be a time when you wish you were still on bed rest. Make the most of it! Often times twins have to stay in the NICU. From the outside looking in the NICU can be very frightening. So many tubes and monitors, alarms and beeps. I can assure you that the NICU is the most nurturing place to be. In fact, I learned some of my best parenting skills from the nurses who cared for my little ones. 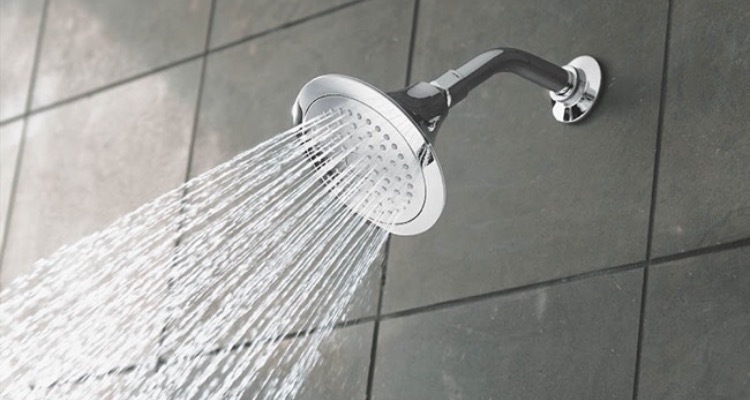 There is always time to take a shower. This is especially true when your babies have just come home from the hospital. Start the day with a shower and you will feel like you can conquer the world. Well, the world of raising twins! Babies sleep A LOT. It might not be the same time you would like to sleep. My suggestion is to sleep when babies are sleeping. You will feel rested if you sleep on their schedule. Speaking of schedule …. Have one and stick to it. 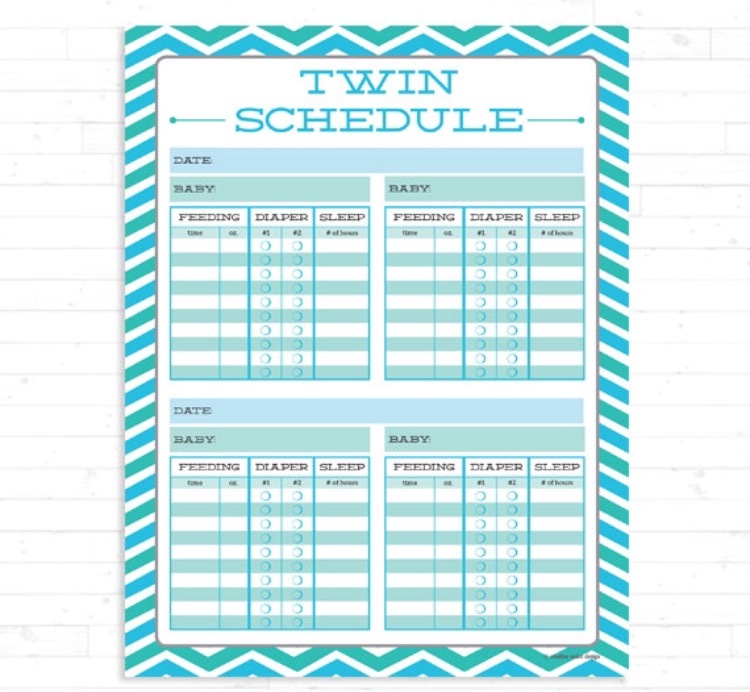 It’s important to keep the twins on the same schedule too. This may require you to wake a sleeping baby from time to time. It will pay off in the end. Don’t be afraid to ask for help. Ask a co-worker to bring dinner. Have a friend dust and vacuum. It takes a village! Join a Moms of Multiples group in your area. These women are a great support system. From the best twin baby gear to how to get one twin from biting the other. These women have all the answers. Plus they will become your closest friends. Feeding twins at the beginning can be tricky. There are many ways to do it, and if you get them fed and happy, then you did it right …. no matter how you did it! 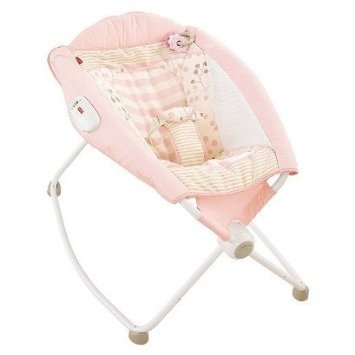 I personally LOVED the Boppy Newborn Lounger. 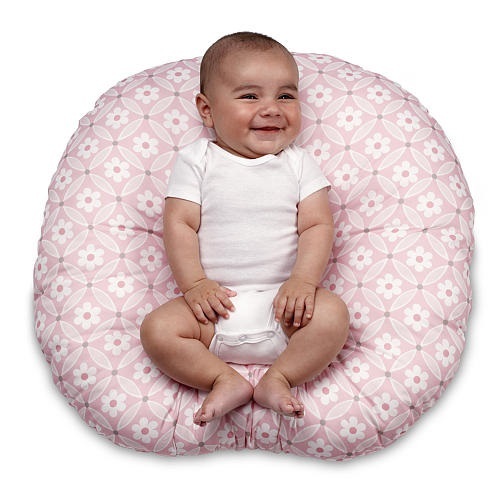 This is similar to the Boppy PIllow but completely circular with fabric in the middle. I would set each of my girls on one side by side and feed them at the same time (It was my general rule that as long as they were doing the same thing at the same time my life was easier, i.e; eating, sleeping, diapering, etc.). You will also need the regular Boppy pillows later on. 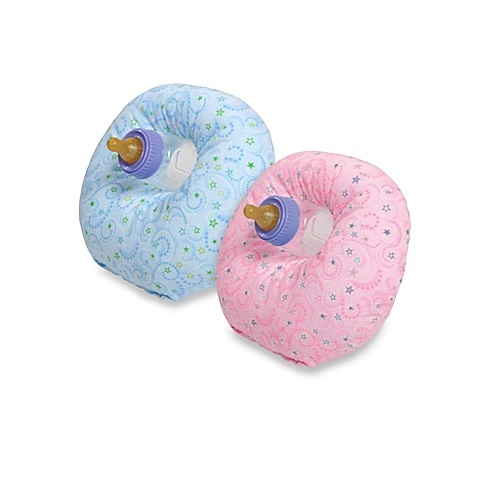 When they get a little bigger it’s fun to prop them up facing each other during tummy time using the Boppy pillows! Makes for great pictures! My girls slept in the Fisher Price Rock and Play Sleepers for quite some time. 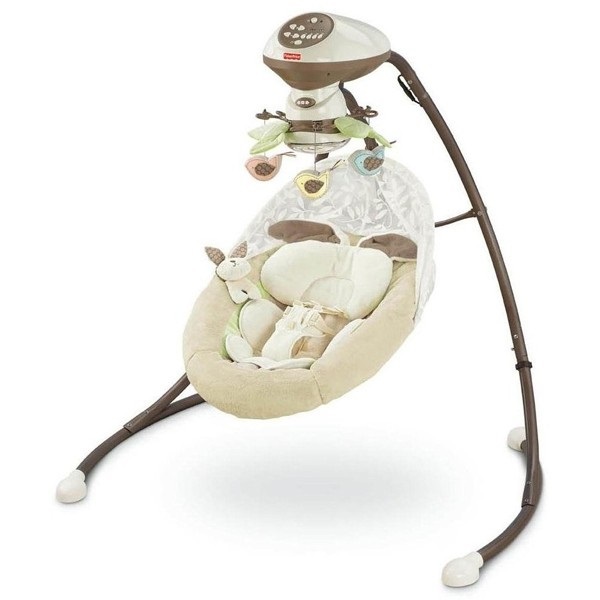 They are lightweight, compact, and very portable, and if one of your babies has acid reflux like mine, this item will keep them propped up which alleviates some pain. We were able to move them from room to room and even brought them with us when we traveled. 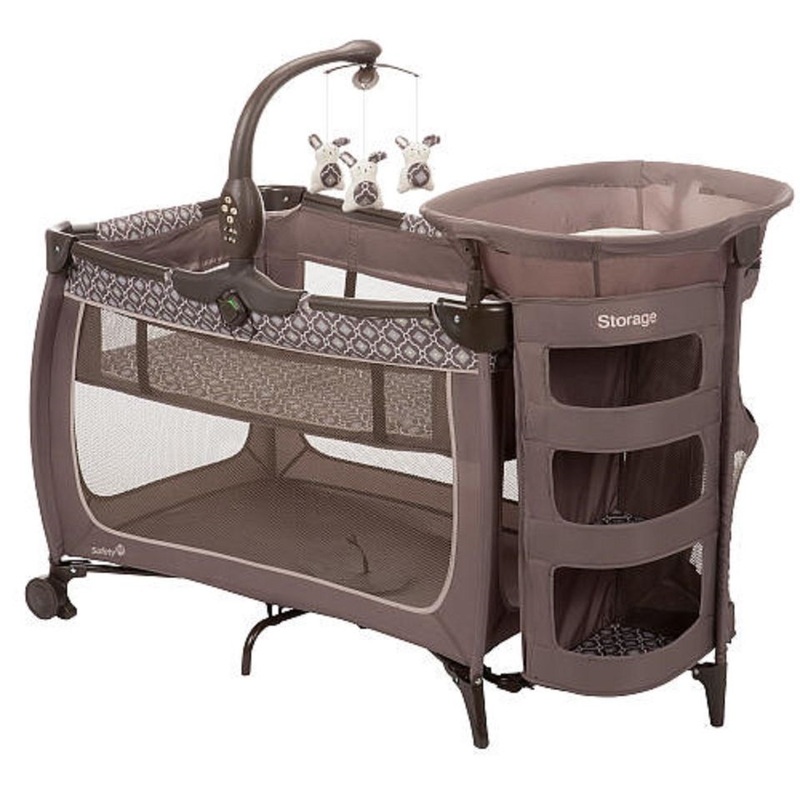 If you are going to get a Pack and Play, I would first recommend getting two, and having at least one of them have a bassinet / changing table option. We kept one Pack and Play in our family room for diaper changes. Diaper changes happen very VERY often with twins! I found it exhausting running both girls back and forth to the bedroom changing table each time they needed a change. I always wanted to keep them both in sight. So, I would place one in the large part of the Pack and Play while I changed the other right there. It is my personal preference that your double stroller be a front and back rather than side by side. There are many store aisles that your side by side stroller will not fit through. We had two swings, and also two bouncers. It is a good idea to have a variety of places for them to sit, lay, and play. Our swing had the mobile on the top that they loved and played music. That was one of the only places we could put them and they would stay content for a while while we ate a meal. The important thing is to know, you were chosen for this job for a reason. You CAN handle this, and you WILL be amazing! You can plan and prepare as much as you want, but nothing will prepare you for the overwhelming love you will feel! Do any of you have something you would like to share with our readers? If you would like to be our next guest blogger, we would love to include your projects or inspiration in our blog. Please contact us by posting a comment below or emailing us at info@sbsdesignla.com. In our previous post, Spotlight on our Faux Painter, we talked about Angel and the various types of projects we have worked on with her. She is truly incredible and there is not a project we have thrown her way thus far that she hasn’t been able to exceed our expectations. 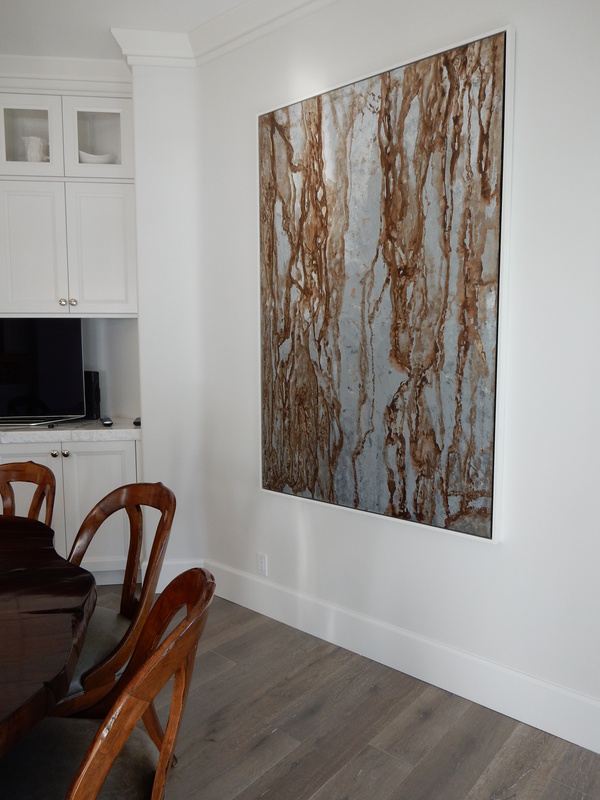 Lauren was working on this particular kitchen and knew that the missing piece was a large piece of art to fill the empty wall in the breakfast area. She looked into many options and decided that the best way to get exactly what she wanted would be to have a piece custom made. She asked Angel if she was up for the challenge and she happily accepted. She has since created four additional custom pieces of art in various genres for several of Lauren’s clients, and we continue to be more and more impressed each day. This is the first piece we were speaking of. We love the rich colors, amazing textures, and the touches of copper she included. The white gallery frame gave this piece an even more polished look. 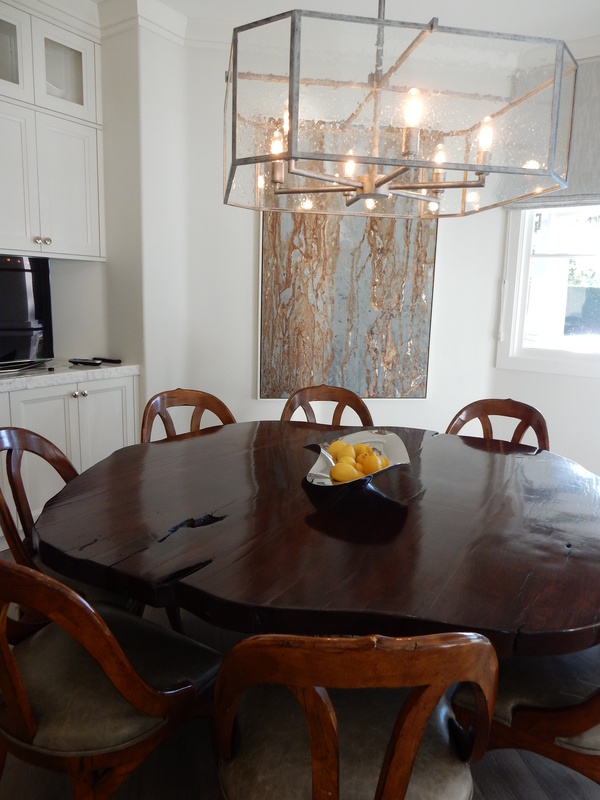 She then created this abstract piece for the dining room in the same house. Its large scale gave Angel the opportunity to really play with texture giving this piece an almost concrete-like visual effect. We added in a few touches of silver leaf in key spaces to dress it up just a bit, and the beautiful silver frame completes the look. She just completed two of these amazing pieces for another client. They compliment each other but are not exactly identical. They are currently being framed and will be hung soon for all to see. 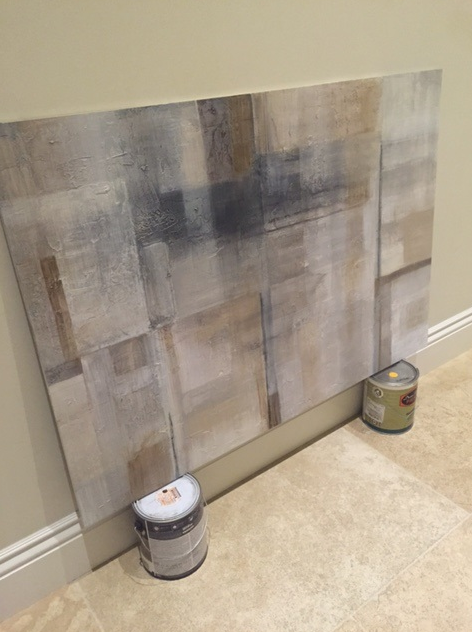 We can’t wait to share this Monochromatic Mediterranean hallway and the rest of its details with all of you. Just this past weekend, Angel was at Lauren’s in-laws (while they were out of town celebrating her Father-in-Law’s 60th birthday) creating a custom mural in their game room. This gift from Robyn to Joel was not the only surprise. 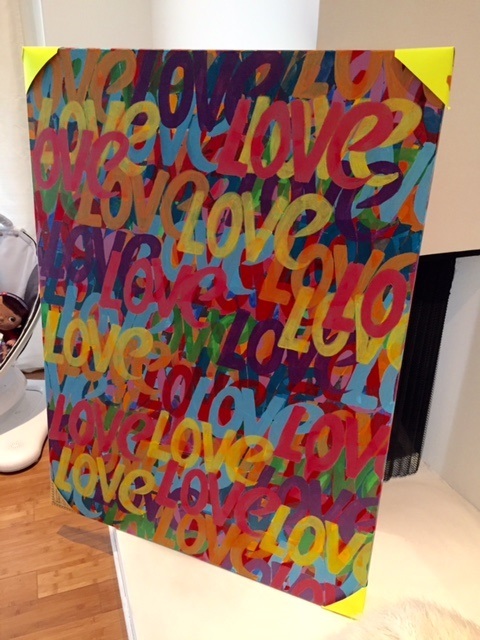 Lauren had Angel make this custom “love” canvas as a gift for Robyn for her birthday from all of her kids, and we just “love” how it turned out! We absolutely enjoy the fact that we can come up with an overall concept for a piece of art, select the colors that we love best, and make any special requests that we or our clients have, making this the perfect art option for so many of our projects. 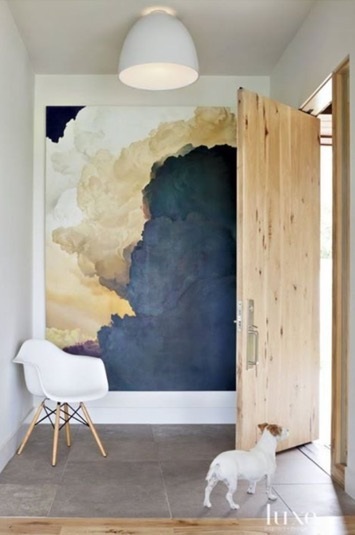 We have already begun working on the next piece and this is the inspiration image our client found and loved. Stay tuned to see how her amazing bedroom is transformed and how this gorgeous focal piece of art ties the entire space together. Lauren has worked hard to fine tune this process and feels like it has been working out really well. We select the size and inspiration image or two to guide Angel in her artwork. She creates her masterpieces in the client’s own home, which allows the clients and Lauren the opportunity to give their feedback as she paints. 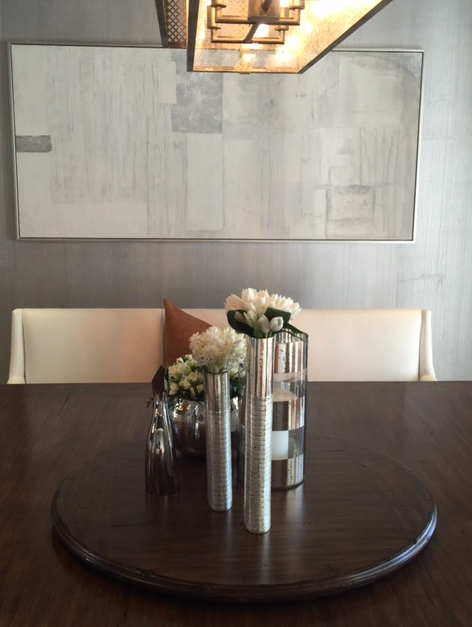 When the piece is completed, it is taken to our framer, and we select the perfect frame to complete the look. This service even includes delivery and installation and is very cost effective. For your own custom piece of art by Angel contact us at info@sbsdesignla.com. 1. Cook one pound of spaghetti in a large pot of boiling salted water, stirring often (about 8 minutes). 2. Drain but hold onto 1 cup of the cooking liquid. 3. Heat 1/4 cup EVOO in a large frying pan over medium heat. Add 1 chopped onion and 4 cloves minced garlic and saute until translucent (about 5 minutes). 4. Add 1 peeled and finely chopped carrot and 1 stalk finely chopped celery until all vegetables are tender (about 5 minutes). 5. Add 1 package cooked ground turkey and sautee for 1 minute. 6. Cover all ingredients in the pan with 3 cups marinara sauce and decrease the heat to medium-low. Let simmer for 15 minutes stirring often. 7. Stir in 1/4 cup chopped fresh basil leaves and season the sauce with salt and pepper to taste. 8. Add the pasta to the sauce and toss to coat. Stir in enough reserved cooking liquid to moisten as needed. 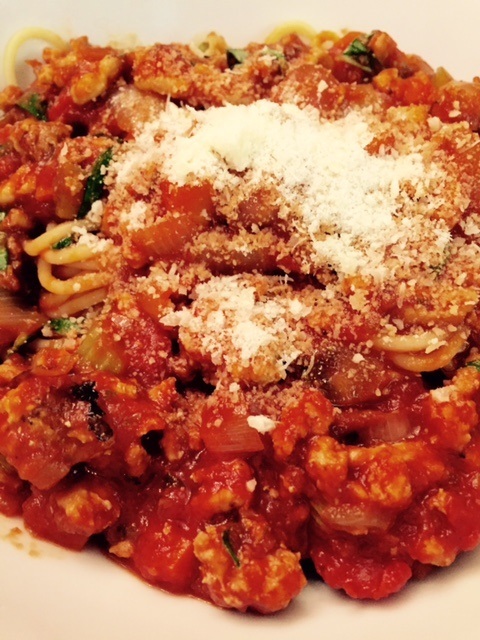 9 Serve with grated parmesan and enjoy! We hope you have enjoyed this edition of our weekly Food Fridays post. Sharing these recipes helps us to constantly be looking for new things to make at home. Do you have a favorite recipe to share? We would love to hear from you. Leave a comment below. 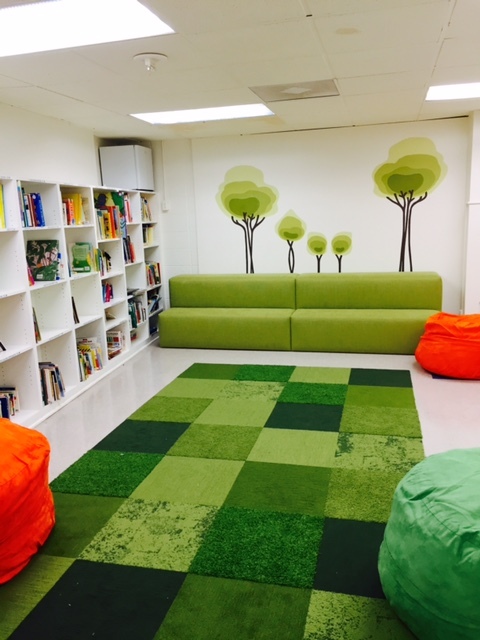 In our previous post, Preschool Library Inspiration, I shared the inspiration for a special space that I have been working on. The Parent Association at my daughter’s preschool have decided to take on a couple of renovation projects per year to freshen up the look of the school, and I couldn’t be more excited to be helping with this process. When I first heard about the library renovation, I knew it could be a special project for me to assist with and I was right. I met with the preschool director and asked her to share with me her wishes for this space both functional and aesthetic and found that she already had an overall direction that she wished to take the entire school in design-wise. 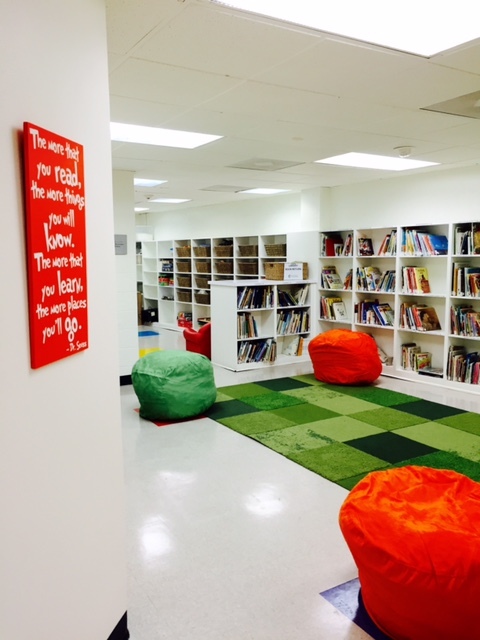 The library was the perfect place to start as it is a common area right in the middle of the school, and I know it will be used as inspiration for the rest of the school as we redesign each space room by room. For this space, we wanted to give the room a more cohesive feel with lots of natural and organic elements while keeping things relatively simple and not over-done. As you enter the room, you are immediately greeted by a famous Dr. Seuss quote (print from Etsy) explaining the importance of books that also happened to match quite nicely. The first thing we did was to reorganize all of the books and categorize / code them to make it easy for parents and teachers to find what they are looking for as well as return them to their shelves when they are done. We were so lucky to have a great group of parent volunteers to help with this process as it made this project go by rather quickly and more enjoyable. The preschool director requested a tiered seating unit for kids to sit on, and I had it custom made to fit the space by my dad (Jackie Bitton Fine Woodworking). 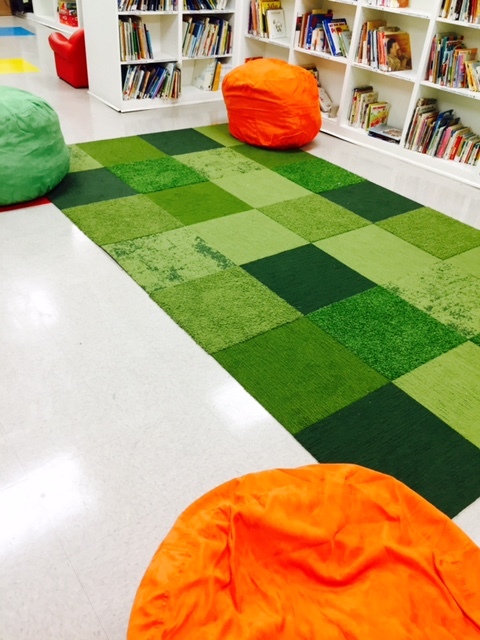 We selected this green fabric due to its fun texture, color, and durability. 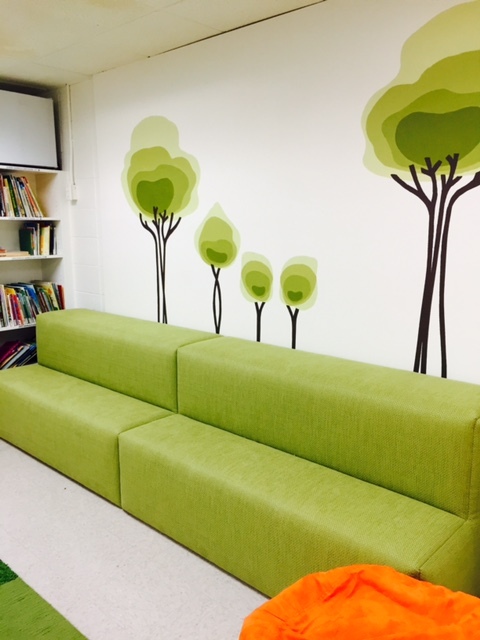 Above the bench, I had my custom muralist paint these adorable trees. I love how unique they are with their modern silhouettes and ombre effect. I custom designed this rug with help from my sales rep at Flor. 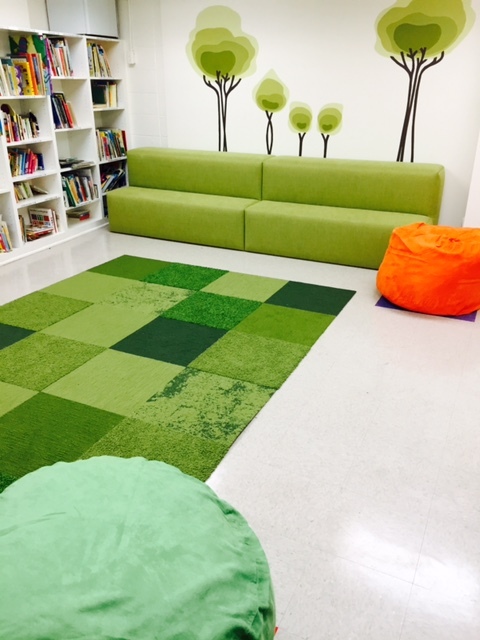 We selected several different green textures to give the overall look a fun and playful (grassy) vibe, and we ordered these cool bean bags with memory foam to use as extra seating from Overstock.com in the perfect accent colors. 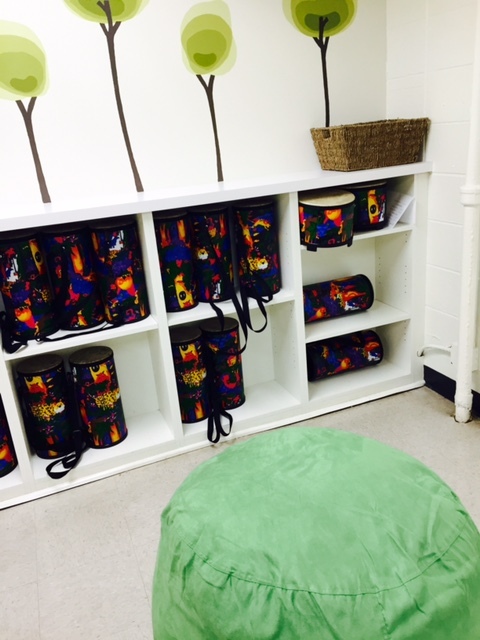 This space is also used to house the drums for the school’s new music program as well as the music class itself. 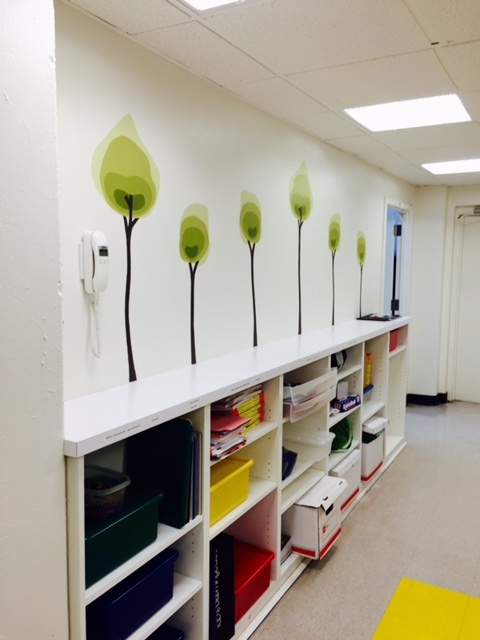 I had the muralist add small trees above all of these low bookcases as well to complete the space. I couldn’t have completed this project without the help of Abbi Hertz, Allison Schwartz, and the two directors of our school. They put in countless hours organizing this space, making labels, and donating un-needed items that were being stored here to local charities. I am looking forward to helping out with the next project and know we can make this school a beautiful and calming environment for our children to grow and learn.